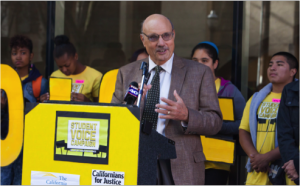 Students Challenge the CA State Board of Education for a Voice, and Win! 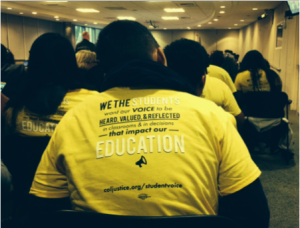 After just 7 months, the State Board of Education has officially approved all of the demands of the Student Voice Campaign! After a year of intense deliberation among lawmakers, education advocates, unions, parents, and students, the State Board of Education unanimously voted in the permanent Local Control Funding Formula (LCFF) regulations. The regulations require districts to include students in the development of their LCAPs and will set the tone for how districts across the state will prioritize and spend new funds that will directly affect millions of low-income students, English learners, and foster youth, in a statewide effort to close the achievement gap that has afflicted black, brown, Southeast Asian, and immigrant students in California for decades. Just a year ago, districts were not seeking student voice as they developed their plans under the emergency regulations adopted by the State Board in January. As a result, an unprecedented number of inspired and well ­organized students across the state challenged the State Board of Ed to give them their rightful place in LCFF with the launch of the Student Voice Campaign. At a Press Conference announcing this victory, California State Board President Michael Kirst made a surprise appearance. He addressed the Student Voice Campaign, and noted that the passing of the regulations was a historical day for Californians and our public education system. Kirst stated that the student leaders had a “thoughtful case”. “As a board member you took an issue around student voice and participation that was not very clear… and probably not very effective”. “Now,” he continued. “You can look at where the regulations started, and where they are now when you [the Student Voice Campaign] ended this effort. There is a considerable difference,” he said. The recognition continued. In Tom Torlakson’s stead, Deputy Superintendent Lupita Cortez Alcala attested to the incredible leadership of students. “As a result of your work you the LCAP template now includes a requirement to include student voice in the process”, she said. Students cheered as they smiled and held up letters that spelled “student voice”. Deputy Alcala continued, “The State Superintendent of Public Instruction [Superintendent Tom Torlakson] applauds Californians for Justice and the Student Voice Campaign in ensuring that student voice is heard when crucial issues are being discussed that affect education and learning opportunities for all…students exemplified the spirit of service and commitment that is essential to academic excellence, school success, and effectiveness”. Just 7 months ago, many students believed they couldn’t win, citing their experiences with adults in the school system. Teachers, administrators, and parents all had a clear role in local control and accountability plans whereas students did not. “The Student Voice Campaign, where we fought to have a formal process, and better transparency in the LCFF regulations seemed far fetched. The idea of adults and decision makers listening to a group of teenagers was like a fantasy or a daydream a couple of us had the guts to attempt,” says Naudika, a student activist from the Oakland Unified School District. Doubts aside, students led a strategic and well-organized campaign, championed by former student board member Jesse Zhang. They flooded the State Board of Ed office with over 2100 Student Voice postcards, met with State Board of Ed members, and garnered the support of 52 allies and school leaders across the state. The outcome: The State Board of Ed agreed that student engagement was in fact essential to successfully implementing LCFF. “Students are the ultimate stakeholders,” said the California Parent Teacher Association. “If you want to fix education, it’s common sense you have to talk to the students”, Liz Guillen said from Public Advocates. 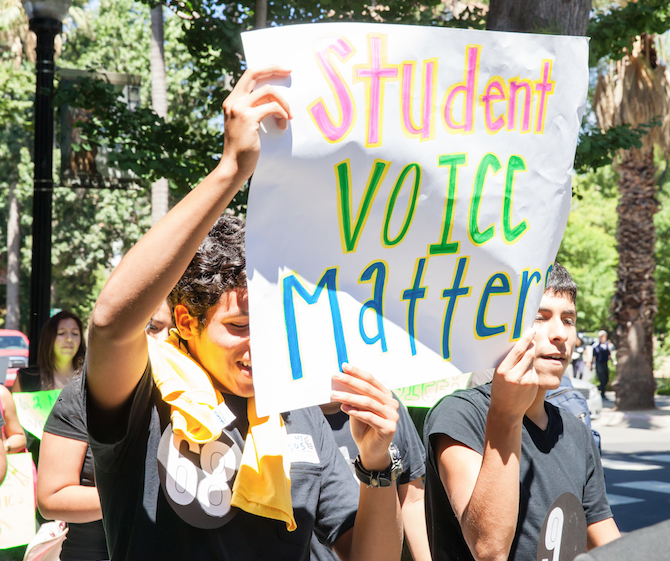 The Student Voice Campaign and leaders paved the way for a landmark victory for Student Voice. Now, 1100 districts, 6.2 million youth, and 4 million low-income, English learner, and foster-care students have a meaningful role in Governor Brown’s new Local Control and Funding Formula (LCFF). For the Student Voice Campaign, this is just the beginning of “the rise of Student Voice in California”. Student leaders will continue to shift the public conversation on the importance of meaningfully engaging and including students in their education. As President Mike Kirst said, “students must carry the message from Sacramento to their local districts”. Student Voice leaders and Californians for Justice look forward to doing just that—closing the achievement gap with the power of student voice.